My TravelScoot is 2 1/2 years old and I use it almost every day -- for work, shopping, and everything in between. I even ride it into the gym four times a week to workout in the pool. With experience, I've become a more skilled user. I (almost always) am a good judge of what spaces I can get through and how I need to maneuver to get there, and in 2 1/2 years my husband (the "scooter wrangler") and I have dealt with routine maintenance issues and learned a great deal about how the TravelScoot works. Knowing how much my mobility is limited without my TravelScoot we'd been talking for several months about buying a second one to have as a backup. A broken weld a few weeks ago put my scoot temporarily out of commission. Melissa loaned me her scoot for several days and we took that opportunity to order a backup. 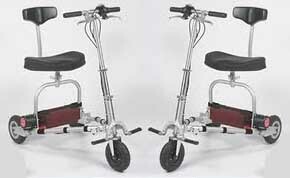 We also boxed my original scoot and mailed it to Tony for repairs. It came back to me in tip-top shape and he'd even replaced my broken original bell. (I love that little red bell and it was my fault the original one bit the dust.) Now I have peace of mind that if I need it, I have a backup scooter ready to go immediately. 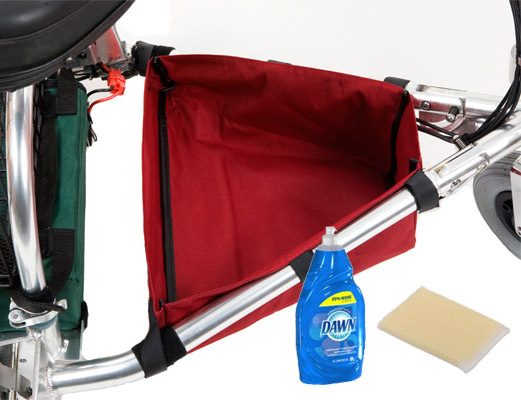 The TravelScoot comes with a fabric caddy that attaches with Velcro between the main frame. A few weeks ago something I was carrying leaked and I ended up with a huge stain on mine. I really didn't know if I could get it out or not. It turned out to be super easy to make it look like new again. We detached the fabric triangle from the scoot and I put it in the kitchen sink. I used a scrubbing sponge and some Dawn dishwashing liquid and it took the stain out immediately. When I was finished rinsing it I dried it with a towel and it was soon dry enough to put back on the scoot.